History Revisited: 50 Years Later Are We Still Reviving Hearts Too Young to Die? Over a period of 24 months, we evaluated 45 consecutive survivors of nontraumatic out‐of‐hospital cardiac arrest. Data were collected according to a standardized protocol following the Utstein guidelines. The subgroup with “hearts too young to die” (group A) was defined as having age < 75 years, ventricular fibrillation/ventricular tachycardia as the initial arrest rhythm, and an interval of collapse–return of spontaneous circulation < 20 minutes. Group B constituted the rest of the cohort. 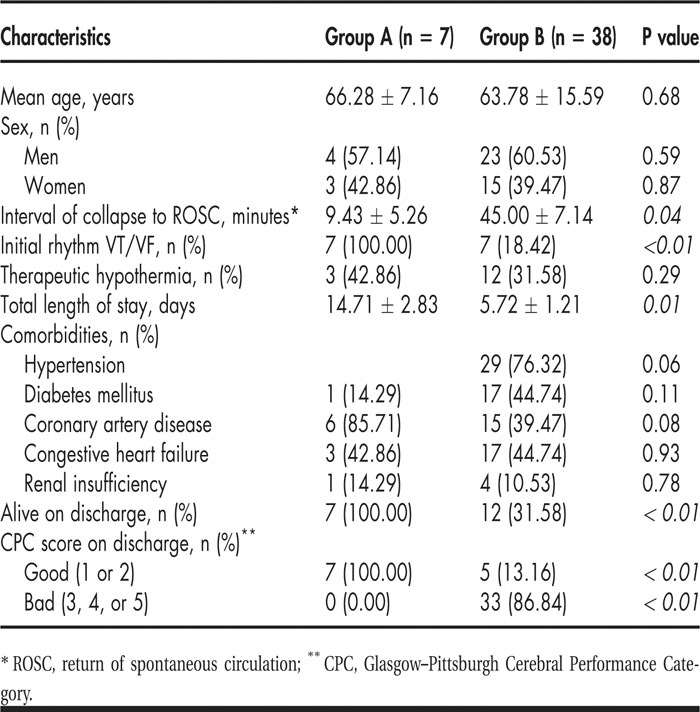 Overall survival to discharge in this study was 42.22% (19 of 45); however, selecting patients with “hearts too young to die” increased the survival rate to 100% (group A) versus 31.58% (group B); P < 0.01 (see Table 1). These data suggest that patients with “hearts too young to die” are in a conspicuous minority but continue to be effectively resuscitated with excellent neurological outcomes. However, CPR is most often performed in patients who do not have viable heart rhythms, and although they may survive to discharge, they are often severely impaired. We concluded that the original premise of CPR has been abandoned, with no obvious evidence of benefit to the extended population. Eid S, Lakshmanados U, Dobrosielski D, Palachuvatil J, Carey S, Stewart K, Chandra‐Strobos N. History Revisited: 50 Years Later Are We Still Reviving Hearts Too Young to Die?. Abstract published at Hospital Medicine 2011, May 10-13, Dallas, Texas. Abstract 41. Journal of Hospital Medicine. 2011; 6 (suppl 2). https://www.shmabstracts.com/abstract/history-revisited-50-years-later-are-we-still-reviving-hearts-too-young-to-die/. Accessed April 25, 2019.